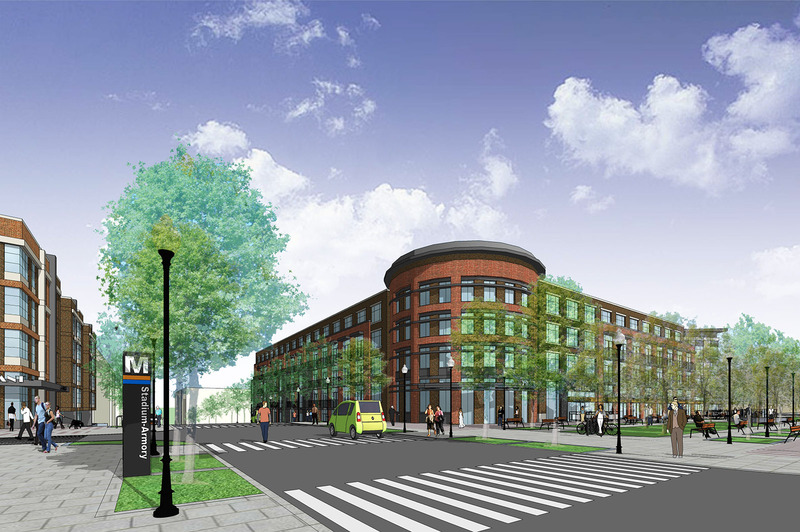 Proposing two mixed-use buildings, one on parcel F1 and the other on parcel G1. Each would be four stories. North Building (parcel F1) would have 113 apartments, South Building (parcel G1) would have 240 apartments. Both buildings would have retail on first floor, with about 10,000 square feet of retail in each. Retail would be focused towards Stadium-Armory Metro Plaza and 19th Street SE. View the floor plan (pdf). Both buildings would be significantly set back from 19th Street SE, with green space separating the South Building from 19th. Donatelli/Blue Skye envisions a farmer’s market and other community events utilizing the green space. I’ll post some more details and my thoughts shortly. In the meantime, post your comments below. Rendering of North Building, which would be located directly East of the Stadium-Armory Metro Plaza. Rendering of South Building on parcel G1. View looking East down the extended C Street SE. Overhead view looking Southeast from the intersection of 19th Street SE and Burke Street SE. View looking Northeast from intersection of 19th Street SE and Massachusetts Avenue SE. Updated 4/26/13: A few more details on the plan above and my initial thoughts. In his presentation, Chris Donatelli, president of Donatelli Development, said that they would like to bring a mix of local and national/regional retail to the first floor of each building. They do not envision large-scale retail like Target, Walmart, etc. My former ANC 6B colleague Jared Critchfield asked Donatelli if his team had considered how the development will fit with the remaining parcels on Reservation 13. 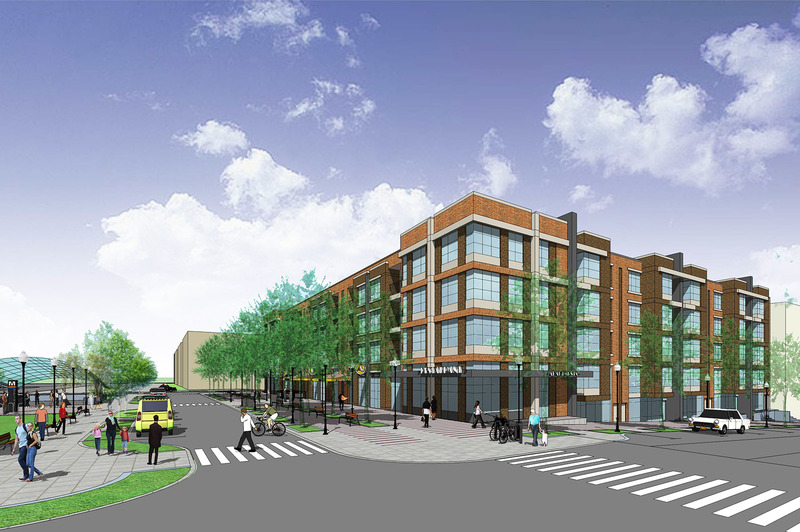 In particular, the current design seems to emphasize the front of the building at the expense of the back and there is no planned retail on the sides of the two buildings (facing the extended C Street SE and extended Mass Avenue SE). Donatelli said they approached the initial design with a focus on parcels F1 and G1 but would certainly look at retail options along the side streets. One challenge is the relatively steep decline in grade on the side streets. I like the idea of the pedestrian promenade along 19th Street SE, though it would be better if the plans eliminated the street between the North Building and the Stadium-Armory Metro Plaza. Instead of creating a pedestrian unfriendly “island” around the Metro Plaza, I’d like to see the street turned into a pedestrian only walkway in front of the retail. Donatelli/Blue Skye plan to include 225 parking spaces on the site, with parking in garages in each building. Parking and loading would be accessed from alleys along the rear of the buildings. They also anticipate metered on-street parking along the extended C Street SE, Mass Ave SE and Burke Street SE for customers visiting the retail locations. In terms of affordability, Donatelli/Blue Skye plan to comply with the affordable housing requirements in law. Specifically, 30 percent of the units will be affordable, with 15 percent affordable to households earning up to 30 percent of the Area Median Income (AMI) and 15 percent affordable to households earning up to 60 percent of AMI. Overall, this is a good plan. There are some areas in need of further work (more retail along side streets, street in front of North Building, etc.) but the Donatelli/Blue Skye plan is certainly consistent with the mixed-use retail/residential development called for in the Reservation 13 master plan. And the Donatelli/Blue Skye team certainly expressed a desire and willingness to make changes and engage the surrounding community in the process. I think it is worth our time and effort to see this come to fruition. Speaking of process, I plan on inviting Donatelli/Blue Skye back out to the neighborhood to share their plans once again and to get further community comments and feedback. The goal is for ANC 6B to send some comments to the Deputy Mayor’s Office before DMPED decides whether to proceed with the Donatelli/Blue Skye plan. I’ll share date/time/location information once a meeting is set. One final thought: It was great to see Ward 7 Councilmember Yvette Alexander and Commissioners from ANC 7F in attendance at the meeting. Our Ward 7 colleagues will also have an opportunity to weigh in on Reservation 13 since it is now in their ward, and I’m looking forward to working with them. Please continue to post your comments/questions below! This entry was posted on Thursday, April 25th, 2013 at 4:05 pm and is filed under 19th Street SE, Development, Reservation 13/Hill East Waterfront. You can follow any responses to this entry through the RSS 2.0 feed. You can leave a response, or trackback from your own site. Brian, thanks for your continuing efforts to keep this moving forward and to bringing such well-organized and reported information to the public. Your efforts are a true service. Your suggestion at Wed’s meeting of having a joint meeting with Ward 7 to solicit broader community input (and information dissemination) was wonderful. I look forward to the next steps — and appreciate the posting of the proposal’s images for review and reflection and future input. Thanks for the comment Colleen, and thanks for your continued advocacy! I wonder if by the time this project gets to the point of asking for a parking variance, the law will have been changed to “remove the minimum parking requirement for buildings within half a mile of a Metro station…” (as reported in the City Paper March 20, 2013). I think we absolutely need to advocate for more retail on the sides of the buildings. Not only will it encourage further development on the other parcels, but it will make it “human scale” which will create a more pleasant experience for residents. All good points and questions. Re: parking, 225 spaces, they plan to provide 250 for 353 units which is above the current parking minimum (assuming that there are more than 57 spaces in the North Bldg and 120 spaces in the South Bldg and assuming that the current parking minimums apply in the special Hill East zoning). 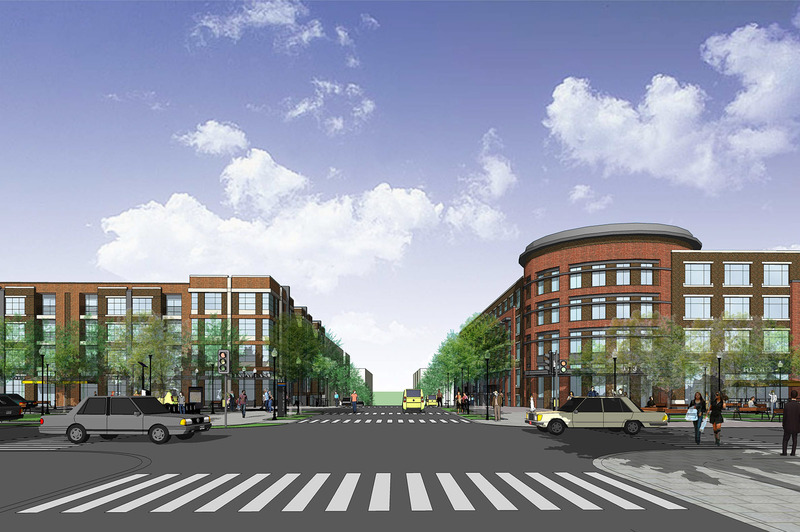 I’d also like to see a rendering of the Mass Ave side, which I assume will be developed/shared as the process plays out. Brian, thanks for providing the details. On retail: I don’t see the need to include retail on C Street extended. The Hill East plan called for focusing the retail around the Metro station entrance, and that’s what this concept does. This makes sense, as that’s where you’d expect foot traffic to be highest. It’s a space that’s naturally ‘public’ given this centrality. I would be curious about the future conversion of the ‘amenity spaces’ in the floorplan you provided that would front on Mass Ave extended into retail spaces. That would also seem to be a logical place to locate some retail (assuming the liner buildings for the DC jail are built as part of the full plan build-out). I share the concern about the road around the Metro entrance – it seems unnecessary and could potentially foul-up traffic operations. Great start to the development effort. “2811.1	For the purposes of the HE District, the term “preferred uses” shall mean retail, entertainment, cultural, or commercial uses. Re: the street at the north building, this street may serve a purpose — it was included in the master plan as a way to separate the traffic for the metro/general through traffic and that for the smaller retailers that were envisioned for that location. The thought being that a couple of teaser parking spaces would benefit the small retailers (an example is market Common in Clarendon/Arlington) and provide a place for “local” traffic to be. I’d like to see some more discussion and thought on that street instead of viewing it simply as “cars bad; walking, biking, bus better”. Even with the new 11th Street bridge, we still get a lot of commuter and bus traffic on 19th. We could be inviting hazardous conditions while trying to solve something else. I wasn’t able to attend the meeting, but I like the plans in general. I especially like the 19th Street promenade. Thank you for all of your work!! Our neighborhood desperately needs more retail and services — I hope the Mayor’s office does not kill this project with disinterest and apathy. 1) What the DC Govt. will be giving to the developers. For example, will the developers be gifted with this land? Or are the developers purchasing the land and, if so, how much will they pay for it. Are there other “sweeteners” being offered to the developers and, if so, what are they? 2) Do the building heights meet the height limits for these parcels as set out in OPED’s Design Guidelines for development of Reservation 13? Looking at the developer’s images of the proposed buildings, I am wondering whether the building heights exceed the design guidelines? These two large buildings seem inappropriately massive to be just across 19th St. from 2- and 3-story rowhouses. 3) In the mid-2000 decade, when OPED solicited proposals for the whole of the Hill East Waterfront (65 acres), the HDG group’s proposal was heavily favored by nearby residents and Capitol Hill organizations. A youtube video gives some sense of the HDG proposal: http://www.youtube.com/watch?v=-rP3P7ddj50. A central feature of that proposal was that C St. — the one street stretching from 19th St. to the waterfront edge of the property — would be a grand bo ulevard with retail lining it on both sides. In the Donatelli/Blue Skye plan, C St. is really a “nothing” street. No retail, rather narrow, no made-for-strolling, tree-lined boulevard. 4) It is sad that OPED is not giving this fine development site — located atop a metro station, on the banks of the visually lovely Anacostia River, with views across to the tree-covered hills east of the river — the handsome, integrated development plan that would make it widely admired.